This may not be the time to buy a new extruder, consider rebuilding as an alterative. Extruder, Rebuilding, Repairs, Conversions, Upgrades and Modifications. All makes and models. Why not consider rebuilding your extruder or having us buy a used extruder and rebuilding it for you. Rebuilding, if required or requested can include. Extruders completely taken apart, down to the bare base - every part inspected: If it is not serviceable, it is repaired, rebuilt or replaced. The gear box completely taken apart, all bearings and gears are inspected. If the gears are not serviceable, they are replaced in pairs. The thrust bearing cleaned and inspected. However, if it is not serviceable, it is also replaced. The barrel honed and cleaned, then measured. If it is worn excessively, we replace it and in some cases resleeving is possible. Vents and injection ports added. The screw rebuilt back to the correct O.D. New advanced feed screw designs incorporated. Heaters inspected and tested electrically. If the machine is water cooled, water flow is tested. If desired, convert extruders from water to air cooled or air to water cooled. All new controllers, relays and contactors, AMP gauges and pressure gauges if requested. All electrical panels and the extruders completely rewired. Die plugs and T.C. plugs installed either in one end of the control panel or at the front of the extruder as requested. Extruders assembled and aligned with a borescope to assure proper alignment. Damaged hoods and sheet metal repaired or new ones are made. Machines are painted to as close to any color that you want as long as we can match that color. 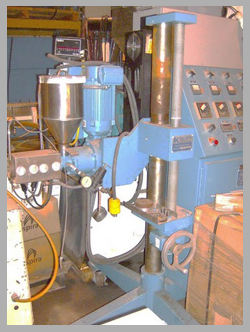 Extruders can be modified to process corrosive, abrasive and engineering materials. Base and L/D extensions etc. Safety equipment upgrades, panel lockouts, emergency stop systems, rupture disks. Installation of extruders, inspect and advise services also available. Send us your old worn out extruders. Let us make your old extruder look and perform like a new one again. Or let us just repair it and get it back in service. Generally, complete rebuilds runs about 50% of the cost of a new extruder, more or less depends on the condition of the machine.